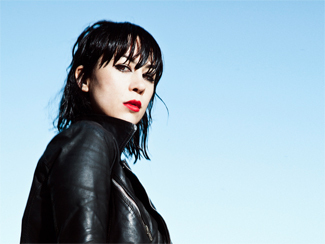 James OrlandoOf all the throwback, garage-rock bands that surfaced over the last few years, it’s been Los Angeles’ Dum Dum Girls who’ve been most likely to both break away from the pack and out of the stylistic pigeonhole. Besides having by far the best visual aesthetic, formidable melodic sensibilities, and Dee Dee Penny’s uncanny Chrissie Hynde-alike vocals, they had songs that were more sophisticated than their peers’ by half. Penny made no efforts to hide her fondness for classic British indie rock or prevent their influence from imbuing her own compositions, and by doing so her slow, melancholic numbers are as stirring as the rockers. As a result, the breadth of the Dum Dum Girls sound has grown immensely over the course of two full-lengths and a handful of EPs without ever abandoning their girl group in a garage roots and so the announcement of their third album, alluded to in a Stereogum interview last week, is exciting news to those curious what they’ll do next. The new full-length will be called Too True and be released on January 28 of the new year. Pitchfork has all the specifics that there are to be had right now, and there’s a first video available to watch. Stereogum and NPR talk to Eric Pulido about stepping up to become Midlake’s new frontman. Their new album Antiphon is out this week and they’ve got a new video for the title track. Wall Street Journal is streaming The Coincidentalist, the latest album from king of the desert Howe Gelb, which is out as of this week. NYC Taper is sharing a recording of Sebadoh’s stop in New York last week; the band have also offered an interview to The Village Voice and made a new b-side available to stream via Stereogum. They’re going to be at The Horseshoe on November 8. Albert Hammond Jr talks to PopMatters ahead of his solo show at The Phoenix on November 10. He’s also released a new video from the AHJ EP via Complex. Grizzly Bear are streaming another of the bonus tracks that will appear on the Shields: Expanded edition coming out November 12. Stereogum and Rolling Stone talk to Wayne Coyne of The Flaming Lips about their new Peace Sword EP, out digitally now and physically on November 29. You can hear one of the new songs via Rolling Stone and check out an in-studio Tame Impala cover for good measure. Detroit duo Dale Earnhardt Jr. Jr. are coming back to town for a headlining show in support of their new record The Speed Of Things on March 14 at The Hoxton; English electronic artist Chad Valley will open up. Wye Oak talks to Spin about the directions their third album, coming in 2014, is taking. Apparently that includes less guitars, which makes perfect sense since Jenn Wasner is such a terrible guitarist </sarcasm>. Neko Case and company got in the seasonal spirit when recording a Hallowe’en Tiny Desk Concert for NPR; she’s also interviewed by The Boston Globe. Rhett Miller talks to Rolling Stone about keeping it loud and loose on the next Old 97’s record and teaming up with some Decemberists for his next solo record. He also chats with Jambands. And as for The Decemberists, Colin Meloy tells Rolling Stone he’s been writing new material for the band while attending to his solo pursuits. Will Sheff of Okkervil River chats with Drowned In Sound. The Rumpus interviews Dean Wareham. Merge Records has announced details of their 25th anniversary subscription series, which will run throughout 2014 as the Or Thousands Of Prizes box set. And to mark the occasion (as well as the occasion of Hallowe’en last week), Superchunk have released a new Misfits cover.